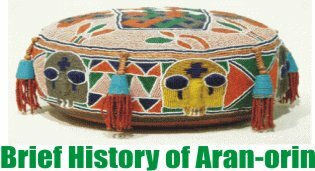 Aran-Orin originated from Ile-Ife. Administratively Aran-Orin is located in Irepodun Local government area of Kwara State. It is a border town located very close to Osun and Ekiti State to the West and South respectively. Aran-Orin is about 8 kilometers to Omu-Aran the local government headquarters. Other towns in close proximity are Arandun, Rore, Ipetu, Erinmope and Ilale all in Kwara state. Ora Igbomina is the closest town in Osun State. In 1971, Prince JOK Abolarin while working on his Dissertation topic for the awards of B.A (Hons.) in History at the University of Ibadan went to Jaran Compound at Ile-Ife, he went in company of some senior chief of Aran-Orin that included the Late Chief Abolarin Esinkin Ilota, and Late chief Baranjoko, the Inurin of Aran-Orin where they confirmed most of this story. While in Ife they were hosted by the late Prophet Elijah Jolayemi and they all met with the Ife high chief from Jaran compound who confirmed the migration of Alaran from Ife to Oyo. However, according to Adeboye Babalola in his book titled “Awon Oriki Orile” (Yoruba classics book 1), he pointed out that Alaran was the son of Ologbojo who led the Aran people out of Ile Ife to where they first settled at Oyo. They stayed for a very long period of time in Oyo during which they were contaminated with some Oyo Socio-cultural practices and characteristics such as the Tribal marks, Egungun festival and Drums like Dundu and Bata. This Socio-cultural adulteration can also be likened to the Biblical history before the Israelites migrated from Egypt, after staying for about Four Hundred and thirty years. It took them forty years before they got to the Promised Land. They travelled through many tribes and imitated their culture and characteristics; as a matter of fact there were intermarriages. At this juncture let me quickly correct the belief in some quarters that Alaran came from Oyo. The fact that Alaran first settled in Oyo does not mean Aran Originated from Oyo! In addition, If one goes to the history of Yoruba land one would see that Ajase, Igbaja, Isanlu and Omu-Aran Originated from Ile-Ife. The Cognomen of these mentioned towns are identical to Aran. For example-Olupo Moje, Olusin Moje, Alaran Moje. These cognomens show that there must have been a close etymological affinity that combined and related these towns together as “MOJE”. Futhermore,in the Sunday Tribune of 21st September 2008,page twenty-two Usi Ekiti gave a historical information that the time of their departure falls within pre-historic time since there was no written records. However what interest us most in their historical information is that Usi-Ekiti first settled at Aran-Orin for some years before they finally reached their present location. The report also said that the Egungun Elefon was brought to Usi-Ekiti from Aran-Orin which they inherit during their stay. According to legend, the progenitor of Usi people, Prince Usikorode approached his Father ‘Oba Lafogido’ then the reigning Oni of Ife for his blessing as he and his followers prepared to leave Ile-Ife to go and found his own kingdom. Oba Lafogido gave him his blessings and some royal paraphernalia like beaded crown, beaded walking stick, beaded horse tail, a sword, a brass cup and some other things. Another point of concern from the Usi Ekiti history is the name ‘Lafogido’ the father of Prince Usikorode who was the reigning Oni of Ife during that time. In Aran history we also talk of Oba Lagodo baba Ademu osoro baba ojo, is there not the likelihood to mean that Lagodo and Lafogido have one kind of relationship or the other? Adeboye Babalola went further in his book when he said the son of Oba Oni Ologbojo was the Alaran who led the Aran people from Ile Ife. Usikorode got his approval from Oba Ologbojo and one of the Alarans was called Oba Lagodo. This information reaffirmed that Alaran and Usikorode originated from Ile Ife and they both took permission from their father Oba Ologbojo to go and found their respective kingdom. And the information that Usi-Ekiti people first settled in Aran-Orin further confirmed the suscipicion that may be Usikorode and Alaran are two brothers who had known themselves before they left their father in ile Ife to found their own respective kingdom. WE MUST ALSO EMPHASIZE HERE THAT ‘ARAN’ HAS ALWAYS BEEN ONE AND NOT ARAN-ORIN OR ARANDUN OR ARAN-OMU OR OMU-ARAN (THIS WAS THE ORIGIN OF THE POPULAR SLOGAN”ARAN E SEJI”). When Alaran and his people left Oyo, they migrated through many places among which is Okeya where they settled briefly before they finally arrived and settled in a place called “Odun”. However due to Internecine wars, Aran moved to the edge of his land closed to Orin river and called it Aran-Orin. Alaran had powerful armies and it was because of his powerful armies that earn him the nickname “Omo Abegunlegbera”. It was this that prompted the then Olomu to invite Alaran to move closer to Omu. The move was further strengthened by intermarriage. Some Chiefs among who is Chief Esaba married from Omu. These Chiefs were said to have moved from Odun to Omu to help their in-laws in their fight to restore peace. These helpers settled at Omu and were comfortably accommodated at Ile-Aran along Aran-Orin road at a place called “Ogun Ajiki” where broken pots and plates, rusty metals inform of knives and cutlasses were found in large quantities. Specifically, it was Olomu Efon who invited Alaran Orii to Omu to help him ward off enemies. After the victory, Olomu Efon pleaded with Alaran Orii to settle at Omu. Alaran accepted and they entered into a treaty. Part of the agreement was that each oba will exist side by side and rule their people independently. Each of them has equal rights on land matters, farm products etc. It was an oral treaty. Alaran settled at Ile-Aran and died there but his remain was taken to Igbo Orile at Odun for burial rites. After the death of Alaran Orin at ile Aran, Alaran Oluyeye, the 15th Alaran and the reigning Olomu were disturbed by serious Ibadan raids. Both of them had to flee to various places. Oba Oluyeye, the then Alaran Orin Flew to Igbaja and there he died but his remain was also taken to Igbo Orile at Odun for burial. They all later regrouped at ‘Ajo’ with Olomu after the war. However ’Ajo’ was disbanded around 1894.A group among the Aran suggested that they should go back to their former settlement but some were still unsure wealther wars or Ibadan raids have ended. The man who led the Aran group to the present location at Aran-Orin from ‘Ajo’ was Chief Olowa of Ile Abaagba.By this time two groups have been established among the Aran peoples. One group at Aran-Orin while the other group remains with Omu peoples in Omu-Aran. It is important to note that the good observation and intelligence of Chief Olowa help recollect and relocate the two landmarks during their first settlement, this land marks include ‘Igi Amuyan” at Ile Oja and a Coconut tree at Ile Abaagba which eventually helped them to identify their former settlement. According to the historical write up by Late Chief Joseph Olajide Olarewaju, his grandfather, Oba Onipede was formerly the Chief Aro at Omu-Aran before he was made a king over all the Aran people both at Aran-Omu and Aran-Orin. He became the Alaran in 1896 and ruled over the Aran peoples for 33 years. During Oba Onipede tenure efforts were made on him to make Aran-Orin his residential abode but he refused. The Aran people made several pleads to him then on this issue because of the likely problems that might arise between him and the then Olomu which eventually come to pass within the first year of his reign. His Successor was Oba Buoye who became the next Alaran in 1929.And the reigning Olomu then was Oba Momolosho who felt threatened by the popularity and richness of the newly crowned Alaran Buoye. Olomu Momolosho then sent an emissary to Alaran Buoye that he could not exist together with him that: ‘Alaso Osun Meji ki igbe ibe’ meaning two kings cannot live in the same town at the same time. He told Oba Buoye to go and join his people at Aran-Orin. Oba Buoye left Omu-Aran in 1932 to join his people at Aran-Orin. They settled at Igbesi compound while in Aran-Orin and leave there for over a year. However he was still not satisfied with his continue stay in Aran-Orin and plead to Aran-Orin people to allow him go to the area close to Igbo Orile at Odun. All appeals to him and his people by his fellow brothers in Aran-Orin were still not convincing enough to him. He then leave to settle in the present site of Arandun in 1935.while they were leaving Aran-Orin to found Arandun, the Aran-Orin people sent delegates to accompany them to their present site. The delegates were led by a ‘masquerade’ in person of late baba Olanipekun Igbesi-Oke (Chief Adigbe) who uprooted the first grass to mark the point of their settlement. He continues to rule over Aran people until when he died few years later. The next king was installed at Aran-Orin who ruled over the Aran people until few years later that the two brother communities agreed to be having their own separate king. Today the two communities still buried their dead kings in Igbo Orile at Odun as a continuation of the established tradition. Conclusively, Arandun and Aran-Orin have been very cordial and friendly. There has never been a land boundary between the two communities because they are from the same progenitors. I give God the glory for making us to see our town and land been know by the whole world and I thank the writer too. We thank God again for making us part of the history. Please consult the colonial archives of the Ilorin province. It will clear the air on wht really happened between Alaran buoye and Olomu. Chief m Momolosho frowned at what appeared to be a plot from Ilorin, leaving letters meant for Olomu at Alaran quarters. AOlomu protested at what is seen as Alaran usurping his powers. In fairness to Alaran he did not ask for messages meant for Olomu to be delivered to him.The district commisioner took the decision to banish Alaran. to prevent Ilorin from driving a wedge between Alaran and Olomu but it was too late. Till today, the Aran that decided to stay put are a prominent part of Omu Aran and the name of Omu was changed to Omu Aran to reflect this. Aran are also part of the Kingsip. @Mr Olayinka Olarewaju, YOU can help get the information as you had suggested in your write up. We will appreciate it.